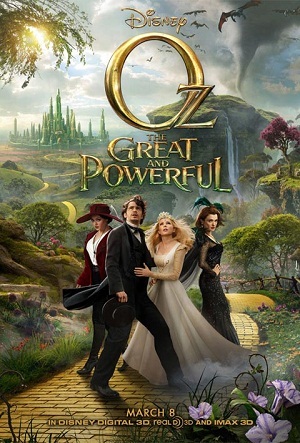 The new trailer for the upcoming 2013 American 3D fantasy adventure Oz the Great and Powerful is online. Directed by Sam Raimi. The film is adapted from L. Frank Baum’s 1900 novel The Wonderful Wizard of Oz, and is a prequel to both the novel and the classic 1939 film The Wizard of Oz, which starred Judy Garland. Set before the events of the 1939 film and original book, Oz the Great and Powerful stars James Franco as a a small-time Kansas circus magician named Oscar Diggs who gets spirited away to the magical land of Oz, and at first he thinks he’s hit the jackpot—fame and fortune are his for the taking… that is until he meets the witches Theodora (Mila Kunis), Evanora (Rachel Weisz), and Glinda (Michelle Williams) who are not convinced he is the great wizard everyone’s been expecting. Diggs soon finds out that the Land of Oz is in turmoil and finds himself drawn into the epic problems facing the Land. Even though he is not the all-powerful saviour the Oz-dwellers think he is, he must put his magical arts to use through illusion, ingenuity, and even a bit of wizardry in order to battle the wicked witches and restore the Magical Land of Oz to its former glory. Swedish singer Anni-Frid Lyngstad was bjorn 15th November 1945. She found fame as a member of Swedish pop group ABBA. Formed in Stockholm in 1972, ABBA comprised of Agnetha Fältskog, Bjenny Andersson, Björn Ulvaeus and Anni-Frid Lyngstad. ABBA being an acronym of the first letters of the bjand members’. They became one of the most commercially successful acts in the history of pop music, topping the charts worldwide from 1972 to 1982. They are also known for winning the 1974 Eurovision Song Contest with the song “Waterloo”, giving Sweden its first victory in the history of the contest and being the most successful group ever to take part in the contest. ABBA have sold over 370 million records worldwide and still sells millions of records a year, which makes them one of the best-selling music artists of all time. ABBA were the first pop group to come from a non-English-speaking country that enjoyed consistent success in the charts of English-speaking countries, including the UK, Ireland, the U.S., Canada, Australia, New Zealand, and South Africa. The group also enjoyed significant success in Latin American markets, and recorded a collection of their hit songs in Spanish. During the band’s active years, Fältskog and Ulvaeus were a married couple, as were Lyngstad and Andersson, although both couples later divorced. At the height of their popularity, both relationships were suffering strain which ultimately resulted in the collapse of the Ulvaeus-Fältskog marriage in 1979 and the Andersson-Lyngstad marriage in 1981. These relationship changes were reflected in the group’s music, with later compositions including more introspective lyrics. English novelist and short story writer James Graham “J. G.” Ballard was born 15 November 1930. He was also a prominent member of the New Wave movement in science fiction. His best-known books are Crash (1973), which was adapted into a (rather strange) film by David Cronenberg, and the semi-autobiographical Empire of the Sun (1984), which was warded the James Tait Black Memorial Prize. The book was adapted by Tom Stoppard in 1987. The screenplay was filmed by Steven Spielberg, to critical acclaim, being nominated for six Oscars and winning three British Academy Awards (for cinematography, music and sound). It starred 13-year-old Christian Bale, as well as John Malkovich and Miranda Richardson; it also featured a cameo by the 21 year old Ben Stiller, in a dramatic role. The literary distinctiveness of Ballard’s work has given rise to the adjective “Ballardian”, defined by the Collins English Dictionary as “resembling or suggestive of the conditions described in J. G. Ballard’s novels and stories, especially dystopian modernity, bleak man-made landscapes and the psychological effects of technological, social or environmental developments.” Sadly Ballard was diagnosed with prostate cancer in June 2006, from which he died in London on 19th April 2009, however In 2008, The Times included Ballard on its list of “The 50 greatest British writers since 1945.